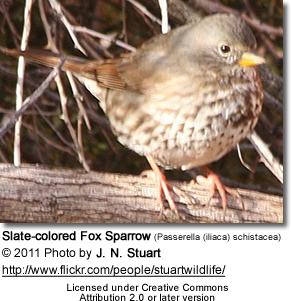 Fox Sparrows (Passerella iliaca) are large American sparrows that breed in wooded areas across northern Canada and the west coast of North America from Alaska to California. They migrate south on the west coast and to the eastern United States. The adult's plumage is heavily spotted and streaked underneath. There are regional differences in the plumage. Adult sparrows go through two molts a year - in late summer and late winter. Juveniles undergo three molts in their first year - referred to as first plumage-cycle. 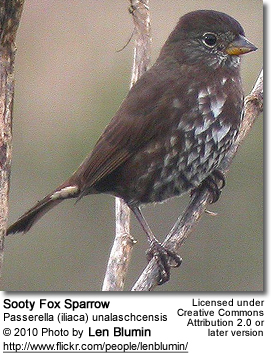 Fox Sparrows nest either in sheltered locations on the ground or low in trees or shrubs. 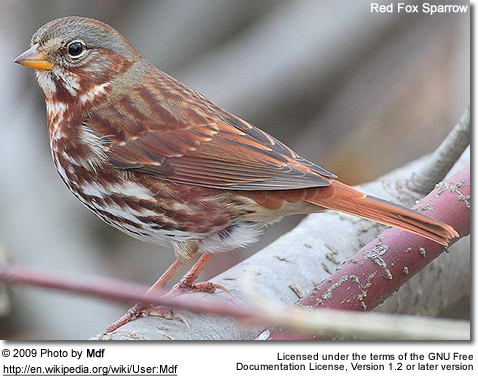 Fox Sparrows feed by scratching the ground with both feet in search of millet or insects. They mostly eat seeds and insects, but will also take some berries. Those occurring at coast may also eat crustaceans (small living animals found on the beaches). In the United States, they tend to be more abundant at bird feeders in the West than the East.